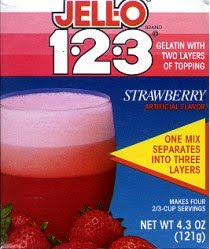 Whatever happened to Jello 1-2-3, which I had been endlessly fascinated with growing up? I remember being at the supermarket with my mother and refusing to leave without this magical substance, with its promise of separating into 3 flavors, or phases, kind of like a culinary rocket ship --each one, according to the photo on the package, creamier and frothier then the next. Anything that would somehow transform itself in the refrigerator, emerging in Star Trek fashion as a morphed version of itself, well, this had to be obtained. So my mother gave in, maybe in part out of her own fascination with the stuff, or else to get me to put the topic to rest. Wasting no time, I flew to the kitchen, concocted the powdery mixture in a fancy glass, stuck in the fridge, and a few hours later, voila! It worked. I was in heaven. So there was the top fluffy, frothy layer, and then the denser, more creamy layer after that, and finally the original Jello. You could mix it all up if you wanted, or be a purist and keep them separate. I liked to keep the layers separate. I liked the mystery in that it took a little while to get to the good part, the real, original Jello which I recognized, which was darn good in its own right. And I kind of liked the variations along the way, the slightly diluted original that presented different colors and consistencies. You might see where I am going with this. The original "you," your business, your online identity, your website, is your bottom layer. This is your core, and it has to be constant. For those who already know you, it has to be consistent with what they have seen and experienced before. For those who don't, it still has to represent a foundation, although even at times a shaky one if you are making a lot of changes or going through a transition. The upper layers are your social media, otherwise known as your sticky self. Maybe they are your Twitter or Facebook, your YouTube or Ning or blog. They represent your slightly diluted self, but in a good way. They represent the things you think about or read, suggest to others, or sell. The media you generate or reference, the quotes you like, the conference you just attended, the e-book you just wrote. They are your playful side, your experimental side, your slightly show -offy side, your learning side. They may not be the core you, but your extended self, out there for everyone to see. So whatever your 1-2-3 thing is, make it good. Have a great top few layers so people will want to get to the real you, the original, the "this is what I do everyday," you, the value added you. Make your core layer a fun and good place to hang out, and people will be curious. They'll come back for seconds. They'll want to hang out with you for a while, and maybe even miss you a little when you're gone. Can they recreate this super duper online presence? Maybe, but it has to be for themselves, on their own, but if they have to follow the directions on the side of the package, it may be a lost cause. Your fantastic Jello 1-2-3 post today is now communicated through my Twitter and Facebook. Yum-O!